With us spending several years in the 2nd tier it wasn’t until the 1988/89 season when our paths crossed again in the Old 4th Division. 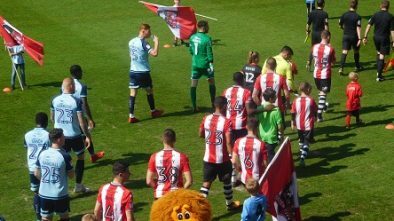 I honestly cannot remember much about the 2 games that season but both finished in 2-1 wins for the home team and both teams finished mid-table at the end of the season. 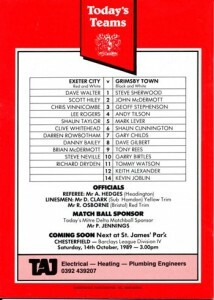 Onto 1989/90 which was a successful season for both teams with Exeter winning the 4th Division title and Grimsby finishing runners up. 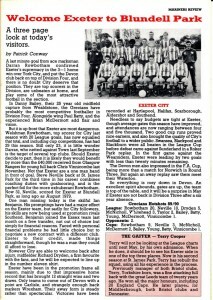 I haven’t checked but I think Exeter’s success that season was based on an unbelievable home record. 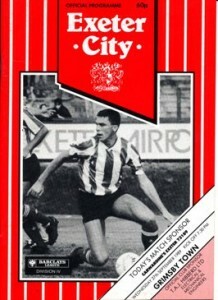 By now I was going to away games regularly and there used to be 3 of us who took it in turns to drive to away games. This season was my first visit to SJP. It was a midweek game and thankfully it wasn’t my turn to drive. 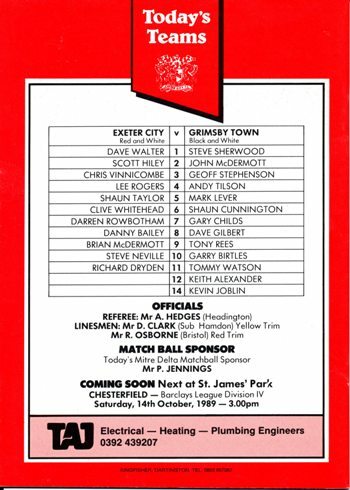 We left Grimsby early in the morning and got to Exeter about 1pm so by the time of kick-off myself and the other non-driver had already had one too many pre-match drinks. My actual recollection of the game itself is rather hazy but we lost 2-1 (to a late winner I think) and it also rained and rained and rained. It’s what happened after the game that still sticks in my memory. We had parked the car in an underground car-park somewhere not far from the ground and when we got back to the car we were all absolutely drenched. 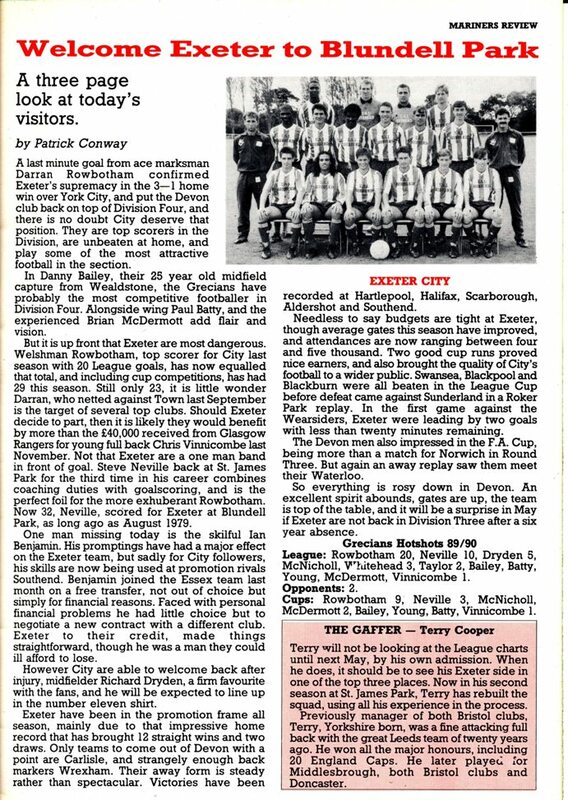 At that time one of my mates had family living near Taunton and we had arranged to stay there overnight instead of having to drive all the way back to Grimsby so we each had an overnight bag in the car. We decided that rather than travel there in soaking wet clothes we would get changed in the car park. Neither of my mates had brought a spare pair of jeans but I had so all they actually did was take off their coats and change their shirts whereas I decided to go the whole hog. The car park was fairly quiet so I got down to stripping off my jeans, pants, socks and shirt. 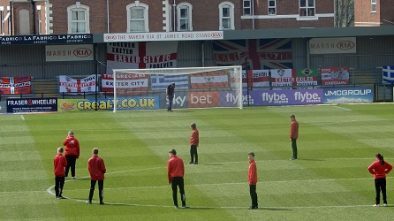 They had already finishing and were sat in the car when a group of about half a dozen Exeter “boys” came round the corner. It was quite clear that they weren’t after a friendly post-match discussion so I, wearing only a pair of pants, threw everything I could into the back of the car and leapt in. My soaking underpants were still laying on the floor as we hot-tailed it out of the car park hastily pursued by the local mob with Ride On Time by Black Box blaring out on the radio with me sat in the back in only my underpants. To this day whenever I hear that song it takes me back to that car park in Exeter. I don’t know if that car park is still there but my soaking wet undies are probably still there somewhere..
Next: Next Up: Port Vale at Home.